With the holiday season rapidly approaching, now is the time to start scoping out all the coolest gift ideas so you don’t end up in a battle to the death for the last coveted hot gift at your local big box store. We’ve rounded up the top ten gadgets of the year in one convenient guide to wowing your family and friends on the big day! The Apple TV has long been one of the most popular streaming devices on the market and starting at $179, it’s one Apple product that won’t break the bank. This year’s version was just released a few weeks ago and the big upgrade is that you can now stream 4K, high dynamic range (HDR) video, with support for both Dolby Vision and HDR10 which are the two main competing HDR formats. Other than that though, there’s not a whole lot of new features, as Siri voice control through the remote and all of the apps were available for the 2015 version. However, even if you don’t have a 4K capable display, the new version is only $30 more and for that small amount it makes sense to future proof yourself from having to upgrade. After all, the next TV you buy will almost certainly support 4K. If you’re new to the device, it will allow you to access almost every streaming platform available, Netflix, Hulu, HBO Go, with one notable exception: Amazon Prime. However, Apple has said that an Amazon Prime app is “coming soon”, which is surprising considering that the Fire TV is a direct competitor. Once that happens, the Apple TV, with it’s inclusion of the iTunes store, will really be the one box to rule them all. Until then, if you are a big consumer of Prime video, you may want to consider the Fire TV. So what about the Fire TV? Well, the new version with 4K Ultra HD is a huge bang for the buck as it offers almost all the features of the Apple TV and for less than half the price. As mentioned, you can access Prime video now with the Fire TV while you’ll have to wait an undetermined amount of time with the Apple TV. One surprising edge that the Fire TV has is that it supports Dolby Atmos while the Apple TV does not. So if you do have an Atmos setup then the Fire TV is probably the way to go. However, on the picture side the Fire TV has one big downside as it does not support Dolby Vision. The consensus seems to be that Dolby Vision is the superior format in comparison with HDR10 and can allow for more vibrant colors and better contrast with an overall more natural and balanced video image. Just keep in mind though, your display will need to support Dolby Vision in order to get this advantage from the Apple TV and not all 4K displays have this feature. The other downside of the Fire TV is no connectivity to the iTunes store, so if you do use your streaming player to access iTunes, then the Fire TV is not the product to choose. So to sum up, if you have an Atmos set up, watch Prime Video regularly and don’t care about Dolby Vision or iTunes, the Fire TV is one heck of a deal for a full featured streaming player. Pro-Ject Audio Systems from Austria have been making high quality turntables for about 20 years now. Their latest entry level model, the Elemental, is actually what it sounds like, an elegantly simple turntable that focuses on audio quality and an affordable price. If you are looking to get into vinyl and don’t want to fiddle with a bunch of settings and would like to just pop the table out of the box and start spinning records in a matter of minutes, the Elemental is for you. Tracking and anti-skate are already pre-calibrated so you don’t have to worry about adjustments. It also takes the guesswork out of choosing a cartridge as it comes with Ortofon cartridge already installed and factory aligned. But should you want to switch that out, it is compatible with other cartridges. The lightweight aluminum tonearm provides accurate playback and the external belt and synchronous motor allow for smooth spinning. However, probably the coolest feature on the technical side is an artificial stone central mass point that anchors the table and minimizes any vibrations. You can add a USB output for an extra $50 if you plan on digitizing your collection and you also have the option to upgrade the MDF plinth to acrylic for $129. The Elemental is the choice for audiophile quality while also allowing you to set it and forget it. The Sphero BB-8 app-enabled droid was the gadget to get a couple years ago when it was released in conjunction with The Force Awakens. This year the Star Wars Saga returns with The Last Jedi and appropriately enough there’s a new R2-D2 droid to accompany it. R2 stands at a taller 6.5″ and can be controlled via the iOS or Android apps. It’s got all the personality of the movie version of the droid, with the ability to toggle back and forth between bipod and tripod modes as well as adorable waddles and all the emotive R2 sounds that you know and love which come from the unit’s integrated speaker. R2’s dome lights up with LEDs and you can use the app to explore holographic simulations. You can also watch your favorite Star Wars movie and R2 will react to specific scenes. Ok maybe nobody needs an app-enabled R2, but many will want it. Relative newcomer to the US TV market, the TCL 55S405 is the TV to get this year if your budget is $500 or less. Featuring 4K Ultra HD with HDR picture quality and 120 Hz refresh rate it supports the latest UHD standard in stunning clarity and color. The Roku TV interface is nice and clean and you can even search across platforms to see which service has a particular title all at once. Should you want to, you can stream audio wirelessly to your smartphone or tablet with Roku app, although we can’t in good conscience recommend such a thing. The remote allows one touch access to HBO, Amazon, Netflix and more. With three HDMI 2.0 inputs, one with ARC, USB port, ethernet, optical and headphone outputs it offers all of the connectivity that you will ever need. And at 55 inches, you won’t be able to get a set of this size from any other reputable brand. The only one caveat is that the set will not allow you to turn off motion smoothing, which it automatically applies to some sources. So if the dreaded “soap opera” effect is your pet peeve, you may consider a set that offers more in the way of control from LG or Samsung. Ok so we’re a bit biased with this pick, but you don’t have to take it from us since Digital Trends named us the best computer speaker for 2017! Look, there are tons of Bluetooth speakers out there, but we don’t think you’ll find any that offer the sound quality that you’ll get from these little giants. The silk dome tweeter produces smooth, natural highs while the woven 4″ fiberglass woofer delivers tight punchy bass. No off the shelf components here, everything is our own custom drivers specifically designed for this speaker. On top of beautiful, detailed sound, not only can you stream Bluetooth content effortlessly, but you can also plug in via digital optical or 3.5mm analog to give you the flexibility to connect to a variety of sources. If you want some more low end to really shake the room, connect a subwoofer via the sub output, which is a feature you don’t see on many Bluetooth speakers. Having said that, the two 50 watt amplifiers that provide the juice to the Allaires can crank out some serious volume to fill even large rooms. But the best part is that with our 60 day risk free home audition, if they don’t completely blow you away you can send them back with free return shipping. You’re probably seeing a pattern by now which is that this holiday season is all about 4K everything. The latest console from Microsoft, the somewhat redundantly named X Box One X, is the first gaming system to offer native 4K content. Under the hood it packs quite the punch with a 2.3GHz 8-core AMD Jaguar processor, 12GB of RAM, and a six-teraflop AMD Radeon GPU. All of which allows Microsoft to tout it as “the world’s most powerful” console. Hold up though, what’s a teraflop you ask? Basically it’s a metric of computing power that measures the amount of calculations a processor can perform per second, but if you really want to get it into it you can read more here. So yeah, it’s a beefy little machine that easily bests the PS4 Pro on all of the above specs. Additionally it’s the only gaming console that comes with a 4K Blu-ray player and it also offers the usual suspects of streaming apps like Netflix, HBO, Amazon and Hulu. Along with 4K it also supports HDR10, 60 fps and Dolby Atmos, but unfortunately no Dolby Vision. The X Box One X is light on exclusive titles thus far, but for a true 4K gaming experience it’s the only choice, unless you want to dip into the world of souped up gaming PCs. To sum up, the X Box One X is a beast and let’s face it, if you’re a true gaming nerd, you will absolutely need this console once Halo 6 finally drops. Of course we believe that the best way to listen to music is through speakers, but we know there are some circumstances, like when you’re at the gym, on public transit or late at night when headphones are necessary. If you will be listening to music through headphones, a separate headphone amp is a good idea to make sure you get a high quality signal to your ears. Enter the McIntosh MHA50 portable digital to analog converter (DAC) and headphone amp. Supporting DSD, DXD file formats and up to 32bit/192 kHz audio it gives you the ability to listen to most high resolution files available. You can either connect directly with a wired connection from any iOS or Android device or stream wirelessly via Bluetooth 4.1. Battery life is good, with six hours for Bluetooth and even longer when using a wired connection. Of course you can also utilize its 32 bit DAC and connect directly to any powered speakers, such as our Allaire Bookshelves. You get all of that in a nice convenient package about the size of a typical smartphone and housed in an attractive beveled case with a classic McIntosh front glass panel and touch sensitive volume control knob. With both portability and the legendary McIntosh quality, its an excellent gift idea for any audiophile headphone enthusiast. The latest Marantz receivers are truly a remarkable step forward for a brand already known for delivering sound quality in spades. Sure, the SR6012 is by far the most expensive item on our list, but it also can perform the widest range of functions as an A/V receiver is truly the “brains” of any surround setup. 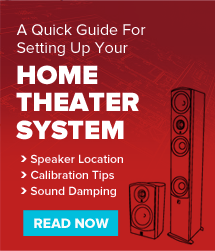 You’ll get a 9 channel 110 watt amplifier with two channels driven at .08% THD, which means you can run up to a 7.2.2 Dolby Atmos or DTS:X system without any external amp necessary. Going along with the theme of this year’s gadgets, it supports 4K/60 Hz pass through as well as HDR and Dolby Vision. A whooping 8 HDMI inputs are included along with 3 outputs including enhanced audio return channel (eARC). It also supports the new Marantz/Denon wireless ecosystem HEOS that is capable of driving HEOS speakers wirelessly in multiple rooms. Since you have 9 channels you can also do a 5.2.4 system with four height channels or just do a traditional 7.1 setup and then drive an extra pair of speakers in zone 2. With an external two channel amp you can run a 7.2.4 Atmos or DTS:X setup, or power zone 3. Built in Wi-Fi with 2.4GHz/5GHz dual band support is included as is Bluetooth, AirPlay, Spotify and more. And of course you’ll get Audyssey MultEQ XT32 room correction software with all of the usual Audyssey features such as Dynamic Volume and EQ. But what about sound quality? The SR7012 features identical discrete high-current output power amplifier devices for each of its 9 channels and also Marantz HDAM (Hyper Dynamic Amplifier Module) technology which provide superior low noise wideband performance. And if we lost you there, suffice to say that the SR6012 includes all of the latest bells and whistles without sacrificing the trademark Marantz detailed sound. After the wild success of the regular NES Classic Edition back in 2016, the Super NES classic was inevitable. Of course in typical Nintendo fashion, demand is vastly outstripping demand. You would think after over 30 years in the business they would have worked out the kinks in their supply chain, but alas a lot of people are going to once again be scrambling for not enough units. If you do manage to grab one, it will likely be more than the $79.99 MSRP. But with preloaded titles like Super Mario Kart, Zelda, Street Fighter II and the all new Star Fox 2, it’s probably worth a few extra bucks to secure one before next year for the nostalgic gamer on your list. It includes 21 titles in all, just keep in mind that it comes with wired controllers, so if you want to roam more than a few feet from the console you’ll need to purchase wireless controllers separately, which may also be in short supply. Perhaps the low stock is part of Nintendo’s master plan, and it admittedly does generate that much more hype around the product as there can be no doubt that the SNES classic THE gift to procure this holiday season. That wraps up our guide to best gifts for that special techy someone in your life, we hope you’ve enjoyed it and happy holidays!